Our wonderful host, WordPress.com, lets us know on its Statistics page what were the leading posts on one’s site for the day, and the day just past. They even provide a link that allows one to learn how many cumulative hits a particular post on one’s site has received over its life. We mention this because for the first time someone actually was listed as having read post “mm167: Writer’s diarrhea” from 11-October-2007. Odd that this popped up when it did; it’s the rare post on the topic of blogging; now that WordPress can show how in the Categories listing on the sidebar many times “blogging” has been used as a category, one can learn that it’s been called out here in this nanocorner of the ‘Sphere© only 15 times in 240+ posts. And of course, I’m certain that constant reader knows that clicking on any category will bring up all of the posts for which the category has been invoked. Most days we try not to be too self-referential or navel-gazing, within the constraints of course of the entire concept of blogging, which is built on self-reference and navel-gazing, and the often much too intimate sharing of one’s quotidian banalities. Ahem. So here we try not to spend too much time in such pursuits, attempting rather to peg the day’s post on one or more external hooks, external being the zillion page world wide web. Once pegged, then one is permitted to be self-referential and navel-gazing, because it’s now in an external context. No secret that among the zillion blogs out there (WordPress.com says that as of this writing it has 2,020,627 blogs with 71,011 new posts today, and they’re just one good sized corner of the ‘sphere, and I do mean good — love you guys! ), there are predictable concentrations of subject matter: religion, politics, the politics of religion, the religion of politicians, etc. This nanocorner has even been known to indulge its political side once or twice (hence the name of the place, (Left-Handed Complement, you know) one supposes). So yesterday I was harvesting promising stories for potential future posts, and I found this one, on a site that MUDGE is distinctly undercredentialed to be reading, The Chronicle of Higher Education. Fascinating to me that before I even went to look for my own entries on the topic of why we blog, and why we choose to read certain others’ blogs, someone came to WordPress’s notice, and mm167 showed up in the stats. Meant to be, I guess. In 1995 the technology specialist Nicholas Negroponte predicted the emergence of “the Daily Me” — a newspaper that you design person-ally, with each component carefully screened and chosen in advance. For many of us, Negroponte’s prediction is coming true. As a result of the Internet, personalization is everywhere. If you want to read essays arguing that climate change is a fraud and a hoax, or that the American economy is about to collapse, the technology is available to allow you to do exactly that. If you are bored and upset by the topic of genocide, or by recent events in Iraq or Pakistan, you can avoid those subjects entirely. With just a few clicks, you can find dozens of Web sites that show you are quite right to like what you already like and think what you already think. Actually you don’t even need to create a Daily Me. With the Internet, it is increasingly easy for others to create one for you. If people know a little bit about you, they can discover, and tell you, what “people like you” tend to like — and they can create a Daily Me, just for you, in a matter of seconds. If your reading habits suggest that you believe that climate change is a fraud, the process of “collaborative filtering” can be used to find a lot of other material that you are inclined to like. Every year filtering and niche marketing become more sophisticated and refined. Studies show that on Amazon, many purchasers can be divided into “red-state camps” and “blue-state camps,” and those who are in one or another camp receive suitable recommendations, ensuring that people will have plenty of materials that cater to, and support, their predilections. Credit for finding this article goes to the consistently phenomenal and charter member of the blogroll Arts & Letters Daily, a regular read long before we ventured into the scary practice of creating content (derivative though it may be ) rather than simply consuming it. Of course, Cass Sunstein’s focus is on those Web 2.0 sites that tailor content to the scourings of past choices; Amazon.com still represents the ultimate commercial application: you bought this, other folks who bought this bought that, we think you might like the other. There are news aggregation sites that do the same, picking up on what you click on, and presenting you with more of the same. Thoof.com is an extreme example, and Mixx.com an even more recent and slightly more high minded one. In Sunstein’s observation, backed by the Colorado experiment cited, once one finds oneself with like-minded people in such sites, reading like-minded bloggers, that mass of like-mindedness tilts one further toward the extreme end of whatever spectrum is on the table. The Internet makes it exceedingly easy for people to replicate the Colorado experiment online, whether or not that is what they are trying to do. Those who think that affirmative action is a good idea can, and often do, read reams of material that support their view; they can, and often do, exclude any and all material that argues the other way. Those who dislike carbon taxes can find plenty of arguments to that effect. Many liberals jump from one liberal blog to another, and many conservatives restrict their reading to points of view that they find congenial. In short, those who want to find support for what they already think, and to insulate themselves from disturbing topics and contrary points of view, can do that far more easily than they can if they skim through a decent newspaper or weekly newsmagazine. And the person with moderate views leaning in one direction continues to read, the leaning’s become a tilt, which reinforced by continual one-sided content, becomes polarization. Thus far, 7½ months in, we don’t feel too polarized, except maybe on a few choice topics: Bloomberg for President, One Laptop Per Child, UAVs, web conferencing (boy am I overdue there!). Covers a spectrum, one hopes, of interests and political positions, nothing too middle of the road, but nothing extremely polarizing either. We’ll endeavor to remain open minded. Tell us if we’re not, won’t you? I’m probably the very final person in the ‘Sphere to write about the Web 2.0 phenomenon, Facebook. It’s simple: I don’t go there. I’m not a college student (wasn’t ever one for long, and that was two score plus years ago), and I don’t need another on-line locale to waste away the hours. But, one can’t avoid encountering it in the (old and new) media, and I will admit to an occasional bout of Facebook-envy, as I read about the increasing average age (“we’re not just for students anymore”) — what am I missing? So far, I’m confining my Web 2.0 activities to my LinkedIn participation, sparse as that is (and I joined that circle about five years ago, before anyone knew there was such a thing as social computing — just networking for job seekers and seekers-to-be), and of course, this daily habit I fondly call nanocorner of the ‘Sphere©. So constant reader is probably way ahead of me encountering the story of Beacon, Facebook’s program that is tracking ‘Booker’s habits, especially buying habits, both within and (wait for it) outside of Facebook. Here at WordPress.com’s site today, they were highlighting a post on the Techland blog from Fortune regarding this Beacon fracas. It stopped me cold. A lot of people say that Facebook has jumped the shark. That’s flat out wrong. In fact, Facebook is now being devoured by the shark. There’s so much blood in the water, it’s attracting other sharks. And if Facebook’s not careful, one of them is bound to come along and finish it off. I’ve never seen anything like it in the annals of fast-rising tech companies that fail. The really weird part of this story is that there’s absolutely nothing wrong with Facebook. It works as well as it ever has, and many of the people who use it (my kids for instance) are unaware of the worsening situation about its privacy-invading Beacon social ads scheme that tracks people’s web-surfing habits even when they’re not on the site. That’s bound to change. The market is fickle, something better is in the wings, and as soon as it arrives, the alienated and angry mob will race to it. Delphi’s errors begat Prodigy and its errors begat AOL, which was crushed by the Web. Quittner paints quite a dire portrait. Facebook, as so many of today’s tech meteors, was begun by kids in college, and its leadership is still quite young. Quittner points out that many such companies earn their maturity by hiring on a senior level guy or gal with some seasoning, in order to avoid fiascoes of the kind currently whipsawing Facebook. MUDGE can be quite objective about this, in a way I suspect neither of today’s bloggers are able to. One suspects that certainly Quittner, and possibly Hansell (let’s face it — right now I feel like the only guy on the planet who is/was not a member), enjoyed their Facebook membership, and the sense of betrayal is palpable. The true lesson of Beacon, in my opinion, is that there is great danger lurking in all of the social media/Web 2.0 space: Unpleasant consequences are possible when the urge to monetize becomes irresistible. Facebook, with its zillions of prime age consumers was a rich prize, too ripe to leave alone. Greed in moderation: it’s the capitalist way, after all. Greed with technological amplification (i.e., Beacon): excessive, even in our world of institutional excess. Okay, so here’s the L-HC warranty: no ads will ever appear here at Left-Handed Complement. No pay-for-post (as if!). Whatever links you find in the sidebar will never result in an outcome that includes dollars, euros, shekels or kopecks. This is a hobby, folks. I spend only my time here; no more is expected of you, and thank you most sincerely for that! As we’ve noted lately (here and indirectly, here), fewer and fewer corners of the planet are immune from that pesky virus: information. Even North Korea has been .0015% more reasonable of late, and the bright lights of media exposure can claim at least a bit of credit (a persistently starving population gets a lot more, of course). So, Myanmar, as repressive a tyranny as can be found (sorry guys, we’re not going to forget about you just because you changed your name; a Burma by any other name…) is once again experiencing civil unrest, and due to the pervasiveness of both MSM and alternative media, this time they can’t hide it or minimize it or freely crush it. The photo that accompanied the NYTimes story is ample evidence of this, in and of itself. BANGKOK, Monday, Sept. 24 — The largest street protests in two decades against Myanmar’s military rulers gained momentum Sunday as thousands of onlookers cheered huge columns of Buddhist monks and shouted support for the detained pro-democracy leader Daw Aung San Suu Kyi. 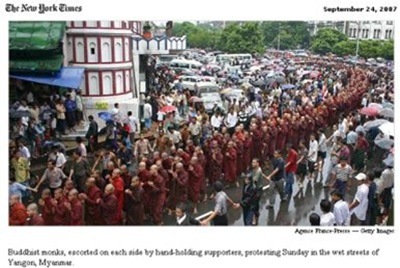 Winding for a sixth day through rainy streets, the protest swelled to 10,000 monks in the main city of Yangon, formerly Rangoon, according to witnesses and other accounts relayed from the closed country, including some clandestinely shot videos. Myanmar’s military government has sealed off the country to foreign journalists but information about the protests has been increasingly flowing out through wire service reports, exile groups in Thailand with contacts inside Myanmar, and through the photographs, videos and audio files, carried rapidly by technologies, including the Internet, that the government has failed to squelch. There’s that pesky Internet again, screwing up the generals’ private party. … is the pervasiveness of information, as exemplified by the liberator of Eastern Europe, CNN, and maybe the liberator of the rest of the shackled world, the Internet. And, let’s give credit: perhaps the (admittedly looking more spurious) Congressional revolution of 2006 wouldn’t have happened at all without the blogosphere. Not the infinitesimal nanocorner of the ‘Sphere© that we ruefully acknowledge as this weblog’s permanent fate, but certainly the heavy hitters like Daily Kos that help keep the kettle aboil, always a good state for the democratic process. Small “d” democracy at work around the globe, powered by electrons. Ben Franklin, Alessandro Volta, Nikola Tesla and all: the free (and hopefully soon to be freer) world owes you a monumental debt.